The Republican Study Committee isn’t the newest conservative caucus on the congressional block. But it’s the oldest, it’s still the biggest, and on occasion, its members will throw their weight around on Capitol Hill. 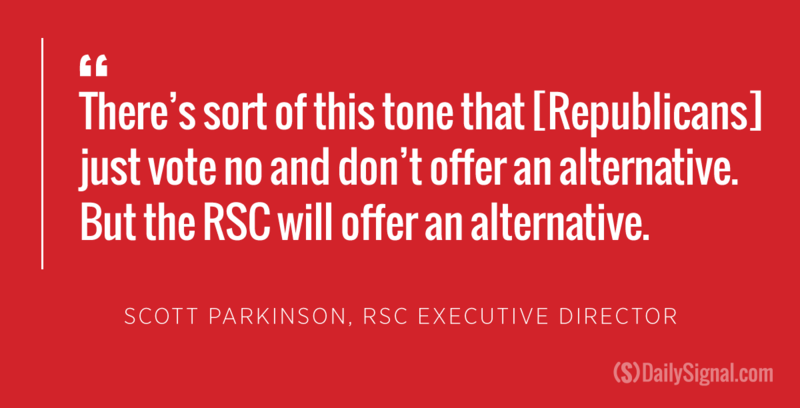 The new executive director of the caucus, Scott Parkinson, wants the RSC to use that political clout to build policy consensus among House Republicans. A veteran Senate staffer, he says that’s the only way the GOP ever can outmaneuver President Barack Obama and Senate Democrats. 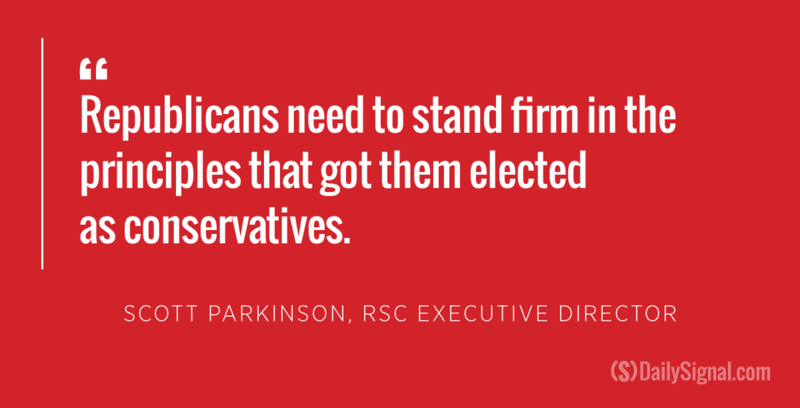 That requires Republicans to offer a conservative policy agenda, Parkinson said. But the former legislative director to Sen. Marco Rubio, R-Fla., lamented the GOP’s lost reputation as the party of ideas. Something of a small think tank inside Congress, the RSC’s dozen staffers manufacture a full menu of conservative policies each year. That’s where the committee traditionally has made its mark. And indicative of that effort, Parkinson points out that the caucus consistently drafts the most conservative budget blueprint with the lowest amount of government spending. While House Speaker Paul Ryan continues to push a budget deal that spends $1.07 trillion, the RSC’s fiscal package proposes a much lower number: $974 billion. That budget, Parkinson brags, is the most conservative in Congress, balancing and saving taxpayers $8.6 trillion in the next 10 years. In addition to big-ticket reform packages such as the budget, health care, and tax reform, RSC staff evaluate every bill and each amendment that crosses the House floor for a vote. With its own policy shop, the group scores all legislation according to its conservative priorities. Still, that analytic mentality has been met with some criticism. On and off Capitol Hill, some complain the academic mindset combined with ballooning membership has made the RSC lethargic and that its sheer size—about 170 out of 247 Republicans in the House—makes it too big to do anything more than generate dusty policy papers. 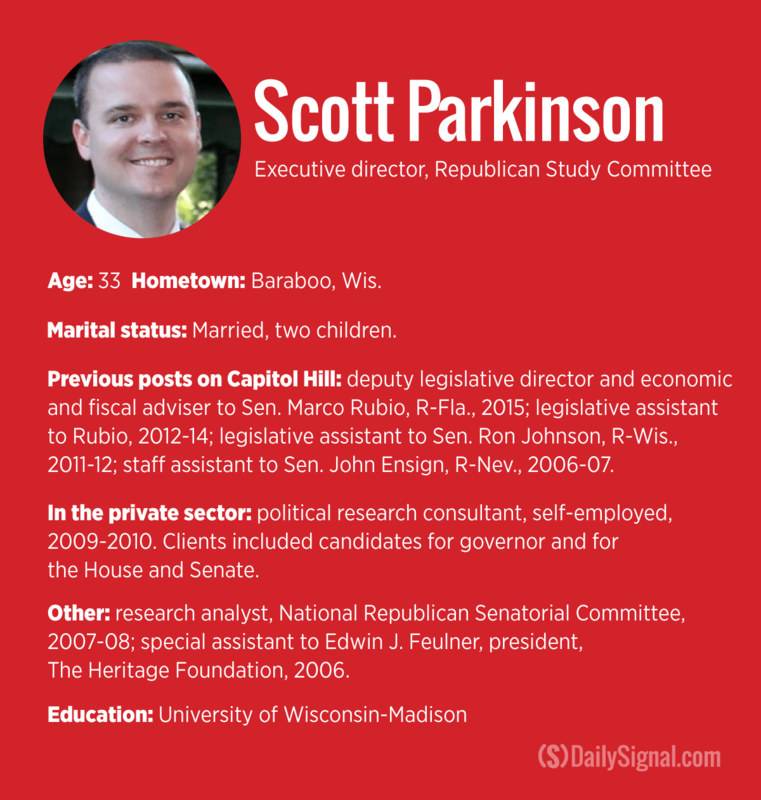 The conservative National Review recently reported that the RSC is making efforts to reclaim its “original vision.” That’s a characterization Parkinson flatly rejects, arguing that the group has served as a conservative standard-bearer for Republicans in Congress. The beginning was 1973, when Richard Nixon was president, Democrats controlled both houses of Congress, and the conservative movement first was emerging inside an entrenched GOP minority. A young staffer for Rep. Phil Crane, R-Ill., Edwin J. Feulner, took point as the group’s first executive director. Inside Congress, the caucus provided a base of operations to advance conservative policy initiatives—goals that didn’t always align with the priorities of Republican leadership. Since then, the group became increasingly influential and a regular clearinghouse for Republican leadership. 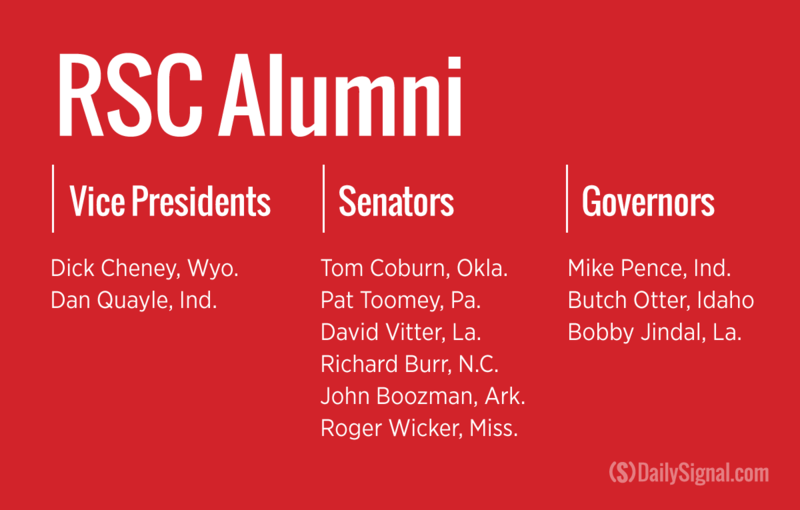 The RSC has a large roster of influential alumni, including seven members who advanced to the Senate, three to governorships, and two to the vice presidency. 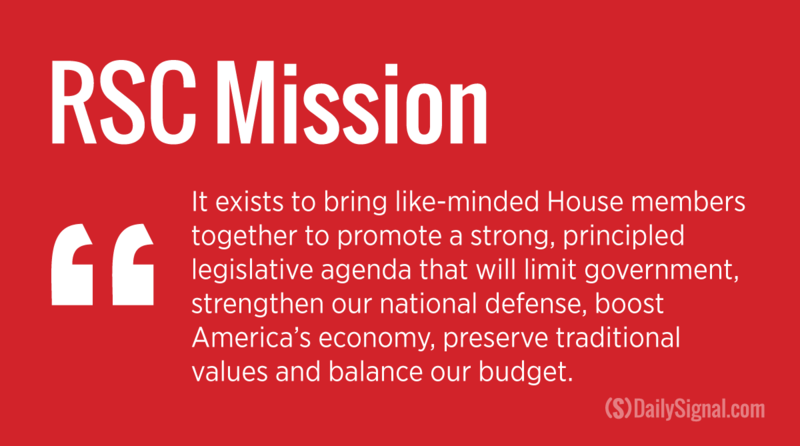 [The RSC] exists to bring like-minded House members together to promote a strong, principled legislative agenda that will limit government, strengthen our national defense, boost America’s economy, preserve traditional values and balance our budget. The group prides itself on providing the intellectual firepower for many of the biggest battles in Congress. Nonpartisan in its criticism, the RSC has opposed policies proposed by both Republicans and Democrats. In the 1980s, the RSC drafted tighter budgets that were farther to the right than President Ronald Reagan’s. More recently, it has led charges on several policy fights such as the Export-Import Bank, the First Amendment Defense Act, and Obamacare. Though it evaluates all legislation, the RSC seldom takes official positions. Instead, the group provides analysis, encouraging members to vote independently. But when the caucus does publicly weigh in, that influence can doom a bill before it makes it out of the GOP conference. So far this year, the RSC has come close to scuttling spending levels negotiated between Obama and former Speaker John Boehner, R-Ohio. The caucus was the first group in Congress to register its opposition—the first significant salvo in a budget battle that continues to dominate and paralyze the legislature. While the group opposes House leadership’s budget numbers, RSC Chairman Bill Flores, R-Texas, works closely with Ryan. And the two have a unique connection: Ryan is the first RSC member to become speaker. “Nothing against John,” Flores said of Ryan’s predecessor, but the new setup “gives us a better chance” at moving conservative policy and stopping liberal policy. Part of leadership’s “cross-sectional advisory group,” Flores meets regularly with Ryan to voice conservative concerns. A former oil executive, the Texan says the RSC’s seat at the table has given it a more influential and muscular role inside the Republican conference. That’s high praise for the organization during a time when a conservative upstart has gained ground in the House. Small, boisterous, and just a year old, the Freedom Caucus has opted for a more media-heavy strategy than the RSC. The 40-some members of that group have grabbed headlines for boxing out Boehner and stalling Ryan’s budget deal. Parkinson sees the relationship between the two caucuses as symbiotic. Without coordination, he notes, the different strategies and priorities of the groups have been complementary. There’s significant crossover in prerogative and personnel as well. Both groups often pursue similar goals and membership rosters. Many in the Freedom Caucus also belong to the RSC, including Rep. Jim Jordan, R-Ohio, who has served as chairman of both. Feulner views the interaction of the groups in more stark terms. “In effect, the Freedom Caucus is the conscience of the Study Committee,” he said. But while both share similar policy goals, Parkinson notes that a staff devoted to rapid research provides his group’s comparative advantage. Donald Trump – Twitter Audit shows 24% or 1,613,612 are fake twitter accounts.